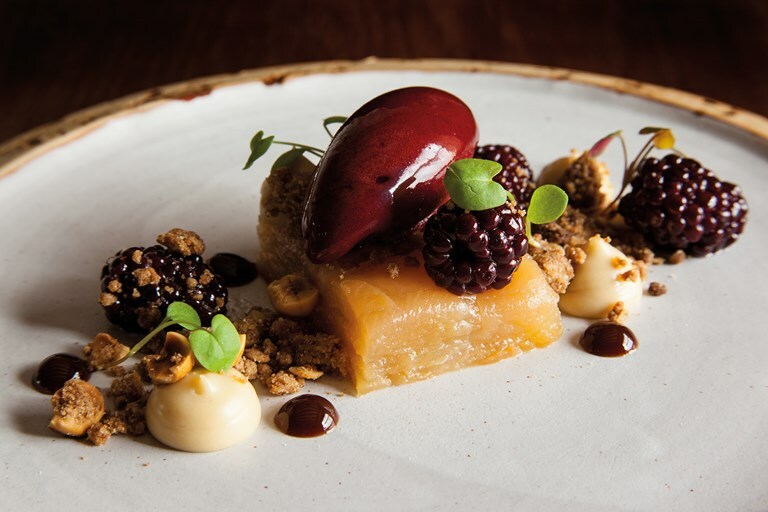 This impressive deconstructed apple crumble dessert from Graham Garrett is a celebration of British autumnal ingredients, featuring apples, elderberries, blackberries and cobnuts. Although there are a number of elements to this dish, each step is relatively simple and well worth the effort. Garrett’s taste for savoury umami flavours means plenty of fish, rustic pork cuts and substantial game and fowl dishes. He also puts as much care into his desserts as the rest of his meals, and they often include unexpected touches - such as an almond cake soaked in Sauternes and peaches and cream made with vanilla Mascarpone.